Symantec IM Manager offers instant messaging management and security with support for public IM networks and enterprise IM platforms including AOL, Jabber, IBM Lotus Instant Messaging, ICQ, MSN Messenger, Microsoft Live Communications Server, Reuters, Yahoo! and GoogleTalk. 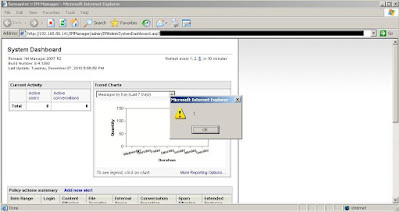 Sow Ching Shiong, an independent vulnerability researcher has discovered multiple vulnerabilities in Symantec IM Manager. These issues were discovered in a default installation of Symantec IM Manager 8.4.17. Other earlier versions may also be affected. 2011-02-18 - Vulnerabilities reported to Secunia. 2011-02-23 - Secunia confirmed the vulnerabilities and contacted the vendor. 2011-09-30 - Advisory published by Secunia.